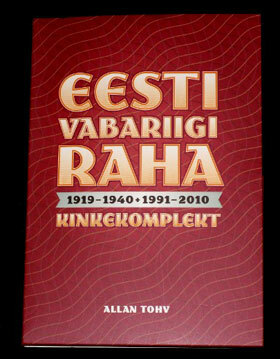 Publication, “EESTI VABARIIGI RAHA” 1919 to 1940 and 1991 to 2010 complete. Estonian Language first print, 2011. From the author of several publications focusing on the coins and banknotes of Estonia, Allan Tohv, a leading expert on the subject, has released a new informative and practical publication which includes illustrations of all the coins and paper money issued by the Republic of Estonia since independence in 1918. Concentrating specifically on the illustrations, the collection of images are brought together in a functional tri-folder presentation whose format cleverly divides these issues from the first and second periods of Estonian nationhood. 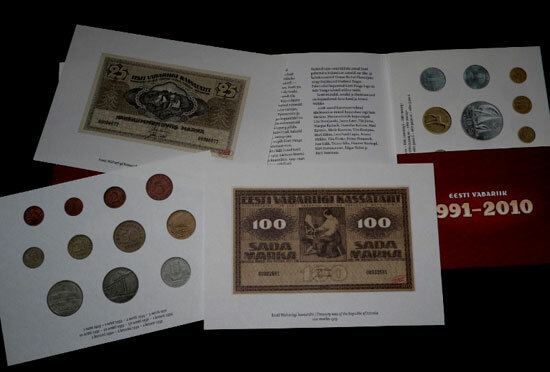 On one side of the folder, the coins and banknotes from Estonia’s first era of independence which covers the marka coins issued in 1922 right up to the last krooni & senti coins issued in 1939. The placards are cleverly printed (and exactly aligned) on both sides in full color and illustrating obverse and reverse images in clear depictions. Also included are images of Estonia’s first payment notes issued in 1919 (50 Marka) fidelity notes, treasury notes (1919 – 1923) – the pre-cursor to eventual banknotes issued by the Bank of Estonia beginning in 1928. 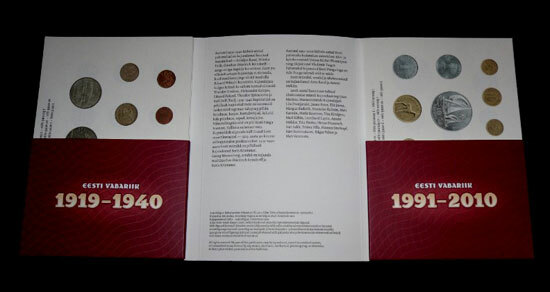 The second side includes both the circulation and commemorative coins issued by the Bank of Estonia since the restoration of Independence in 1991. The first coins, also dated that year are illustrated as well as the first silver commemorative coins issued for the 1992 Summer Olympics. 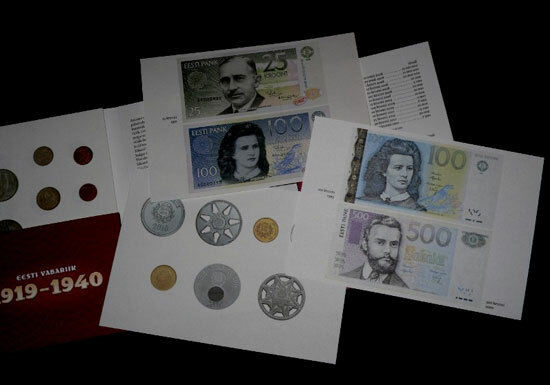 Images for the gold and silver collector coins dated 2010 which mark the introduction the Euro are also included. Estonia’s beautiful and colorful banknotes highlighting prominent Estonian personalities were introduced in June 1992 (with notes dated the year before) in denominations from 1 to 500 Krooni. This series along with a revised series including the 25, 100 and 500 Krooni notes continued as Estonia’s legal tender until the introduction of the EURO single currency in January 2011. Images for the series of banknotes, those dated 1991, 1992, 1994, 1996, 1999, 2000, 2002, 2006 and 2007 are all comprehensively included. Each side of the folder includes a listing of the placards with a brief description and their official mintage or note issue numbers. The placards measure 20 / 14 cm. and are printed on high quality white cotton paper. Each placard is suitable for framing or mounting. 50 placards in all are included. Many of the images included are taken from Mr. Tohv’s own extensive archives and depict some very rare and hard to find examples of Estonia’s short-lived currency notes only seen at the Bank of Estonia’s currency Museum. The notes are also depicted in their actual dimensions and full color. Any new issues of mint and proof coin sets or commemorative coins from Estonia? What is the issue of commemorative coins for Estonia in 2013 and2014? I haven’t yet heard any news of a commemorative coin for this or next year but, I would suggest watching this space and if you like, you can also visit the website of the Bank of Estonia http://www.eestipank.ee/en/notes-and-coins/estonian-collector-coins and Estonian post, http://www.post.ee/10220 who sell any available coins at issue price direct to collectors to most countries. The catalogue mentioned above is a complete comprehensive guide to all coins issued before the issue of the Euro in 2011 – great images!